Kolesnik is among the ‘Top Ten Most Interesting Russian Internet Entrepreneurs to Watch’ identified by blogger and Internet Entrepreneur Yakov Sadchikov for The Moscow Times. Six out of ten are women: Alisa Chumachenko, founder and CEO, Game Insight; Yulia Mitrovich, Entrepreneur in Residence, Svyaznoy Group; Elena Masolova, co-founder and CEO, Pixonic; Anna Znamenskaya, founder, Workingmama; Olga Steidl, CEO, Talkbits. In May DLD gathered the Russian tech-savvy elite and international community for a cross-over conversation at the conference in Moscow. Kolesnik was one of them. 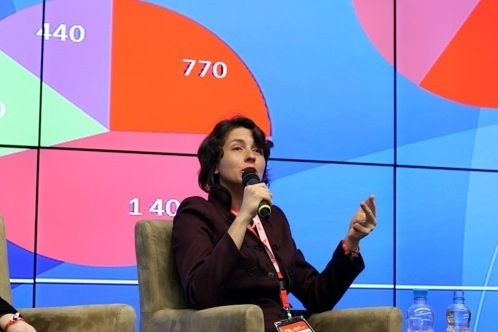 On stage, she showed what it takes to become a star at the Russian e-commerce firmament. With her own online venture Oktogo.ru she said to find her customers’ comfort zones: over the phone or face-to-face bookings by partner businesses. This also provides a solution for Russia’s cash economy, as “50% of Oktogo’s customers aren’t paying by credit cards,” Kolesnik said. In Russia, one must be an online company with an offline mentality. Women seem to be extraordinarily good at combining that.